A koala nestled in a tree and munching on leaves may be the scene in your mind when you think of a eucalyptus tree. While eucalyptus trees are native to Australia and a favorite food source for koalas, the trees flourish in different parts of the world, including coastal regions of the United States. Eucalyptus trees originated in Australia. Different varieties have spread throughout the country, surviving in vastly different climates from north to south. There are at least 600 species of eucalyptus; much of the cataloging of species was done by explorers between 1770 and 1867. Eucalyptus trees like full sun and tolerate several types of soils, from clay to sand and loam. The preferred pH of the tree ranges from alkaline to acidic. Eucalyptus trees tolerate drought and recover vigorously from fires; according to the PBS show “Nature,” eucalyptus trees produce buds in response to extreme heat. Eucalyptus trees suffer from leaf spot, crown gall and powdery mildew, and several types of pest. They are usually used as landscaping trees, but the University of Florida IFAS Extension notes that it is possible to grow at least one variety (Eucalyptus ficifolia) in a container. Eucalyptus trees are cold-hardy to zones 9 or 10--each variety is different--and Louisiana State University’s AgCenter notes that trees that are more tolerant of cold are in the works. Eucalyptus trees thrive in California, and they are now being cultivated in southeastern Texas and Louisiana. The AgCenter reports that paper mills want to use eucalyptus as part of pulpwood, so farms are planting the trees as an extra way to make money. Eucalyptus were introduced into California in the 1840s and '50s, also as a tool for making money; Robert Santos, of California State University, Stanislaus, writes that miners during the Gold Rush most likely planned to use the trees’ wood for construction materials. A 2008 article in the Scotsman pointed out that eucalyptus leaves in Australia were becoming poisonous to koalas. Increasing atmospheric carbon dioxide was changing the level of nutrients produced by the trees; substances thought to prevent proper digestion in koalas were increasing within the leaves. 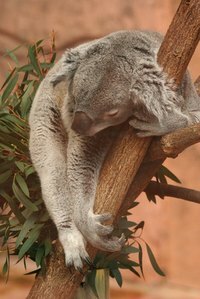 The article stated that as koalas eat leaves from only specific tree species, this change may result in a drop in koala population within 50 years. Keep in mind, if you plan to plant eucalyptus trees, that their roots are quite shallow. The trees are prone to falling over in high winds, and the high oil content can add to fire danger. Is My Eucalyptus Tree Dead?